When Western states joined the Union, the federal government granted them parcels of land in order to provide sustained revenue for public institutions, primarily schools, and to spread democratic ideals in the growing region. Older states, such as California and Oregon, have little acreage left today because they quickly sold off their “trust lands” to generate money — a move that clashed with the federal government’s long-term vision for those lands. So when newer states like Arizona and New Mexico received their trust lands, the federal government, and sometimes the states themselves, placed restrictions on sales, such as minimum prices. Today, these states retain much of their original acreage, and generate money primarily by leasing parcels to developers and the extractive industry. 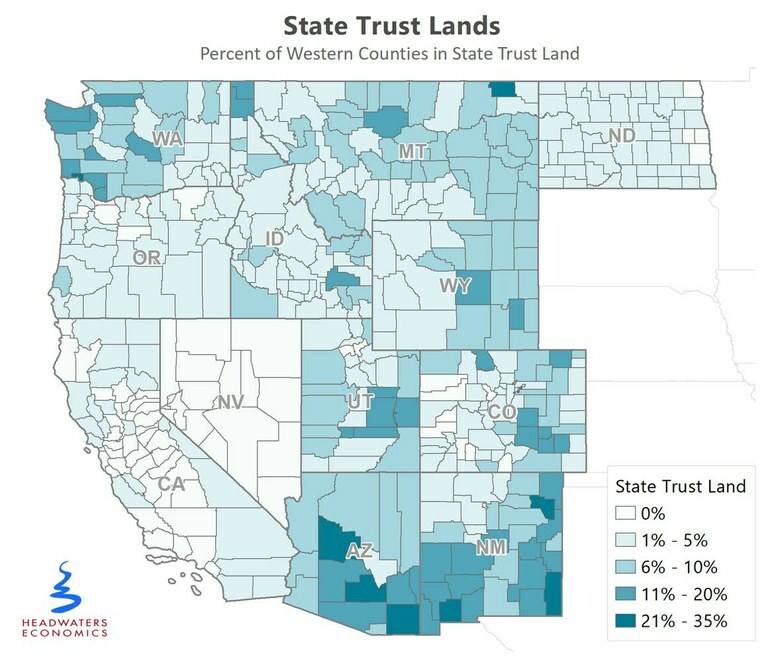 There are 46 million acres of state trust land in the U.S., most of it in the West. Here’s a look at the different approaches Western states take to these lands. In the Pacific Northwest, timber is the main source of revenue from state lands. 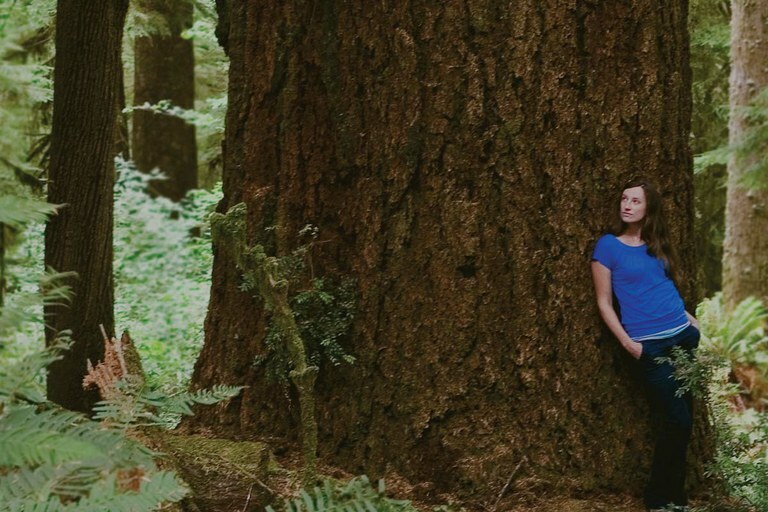 But Oregon is beginning to take a broader approach: Instead of focusing only on logging, it’s managing its lands for conservation and recreation, too. The transition hasn’t been easy. Last year, the Elliott State Forest, which shelters endangered species and is popular with hunters and hikers, was put up for sale. Timber revenue was low, and managing the forest cost the state money rather than enriching it. After intense public outcry, the state resolved to find a way to keep the forest in public hands. Now, it’s planning to buy out tracts of its own forest. That way, schools would get money, while areas occupied by endangered species would be relieved from the pressure to be profitable. Other parts of the forest would still be logged, however. Old growth in Elliott State Forest. Before the 2008 recession, Arizona raised huge sums by selling or leasing land to real estate developers. In 2007, the state raked in over $600 million this way, with bids from developers coming in as high as 15 percent above the lands’ appraised value, and one 26-acre parcel in northeast Phoenix selling for $28.5 million. Overall, however, Arizona has sold about 10 percent of its state lands. It retains 9.2 million of the 10.2 million acres it was originally granted. 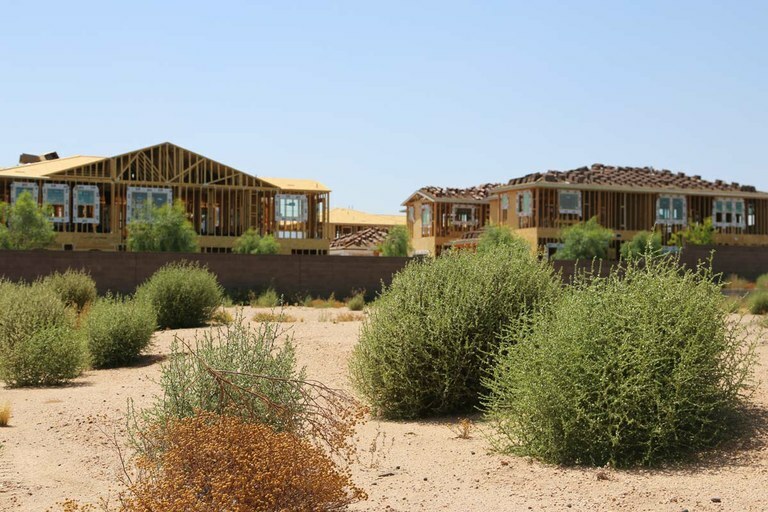 Construction underway at a new development in northeast Phoenix, purchased from the Arizona State Land Department. New Mexico makes by far the most money of the Western states from its trust lands, many of which are in booming oil and gas-producing basins. An analysis by the Property and Environmental Research Center found that from 2009 to 2013, the state made $69 in revenue per acre of state trust land. Montana’s timberlands, by contrast, brought in only $20 an acre. The biggest revenue generator on Utah’s state lands is also fossil fuel leasing. Of the $700 million in gross revenues generated by the state’s oil and gas sector since 1994, around 20 percent has come from one 127,000-acre unit in Carbon County. The state has also permitted tar sands mines and oil shale operations on 32,000 acres of trust lands. Though environmentalists fiercely opposed these developments, which are even more carbon-intensive than conventional oil, they had limited legal options to stop them on state lands. The tar sands industry is still struggling, however, and commercial production has yet to begin. 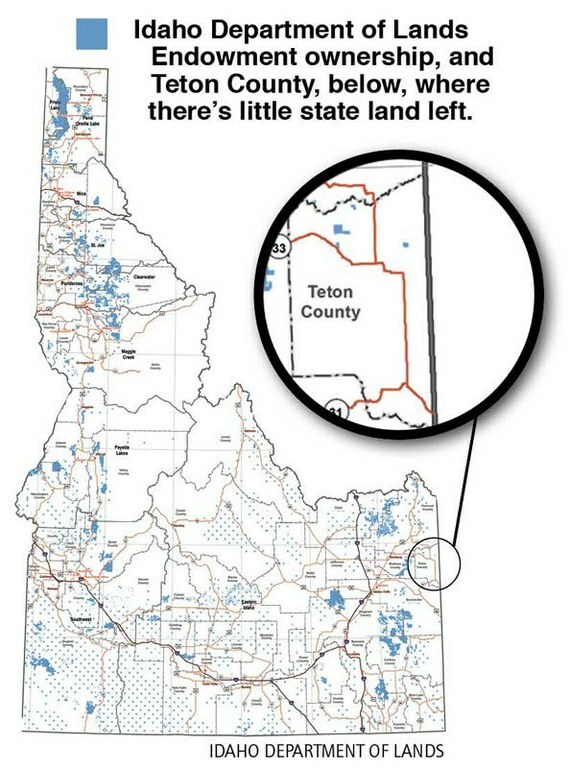 Teton County, Idaho, which borders Grand Teton National Park, received 39,740 acres at statehood, but now has just 1,158 acres. (Overall, the state has retained 67 percent of its original lands.) The sale of state lands to Teton County farmers, initially intended to increase the county’s tax base, ultimately expanded the amount of land open to residential development. Starting around 2000, tourism, new home construction and personal income skyrocketed, and many farmers sold their land for development. After the recession, though, half-finished housing and abandoned commercial developments became a blight on the landscape.